It's not as if I have loads of free time that I have no idea what to do. To be fair I do have more free time than many, but there's always something I COULD be working on for Surrounded by Scraps. But several months ago a friend approached me and asked if I'd be interested in joining her in a little venture. We had met a few years back while working at the same quilt shop (after both having worked at different places in the region, overlapping several coworkers along the way) and managed to stay in touch to an extent after leaving. In the last year or so we started connecting more often to have sew days and work on projects and meet for drinks and/or shopping adventures. Along the way we seem to have learned that our tastes are similar enough to bounce ideas off of one another, but not so much that we don't each bring a slightly different perspective to the table. Cherie had the idea of working toward a kitting business. Quilters know that kits come in all shapes and sizes, styles and combinations, fully fleshed out and just the hint of a suggestion. We both happen to love to put together our own fabrics so therefore are not terribly inclined to actually purchase kits, but in our retail experiences have put together quilt kits for other companies. And we both love the process! And if I do say so myself, we're pretty darn good at it, too! Or so I've been told. We each have established business entities for our own quilting and design endeavors. We've both been working in retail for several years, mostly within the quilting and fabric industries and are perpetually inspired by what is out there and available to design with. But I think we also are both looking at the kits on the market and thinking, "is this something that I (or someone in my quilt group/guild) would purchase?" I would guess, and I stress that this is truly just a guess, that about 90% of the quilt kits available fall into at least one of 3 categories: 1.) traditional, 2.) all-batik / applique, 3.) pulling from one single fabric collection. We are hoping to fill a hole in this market... unique kits geared toward more modern patterns that combine fabrics by several different designers in a still cohesive group. For our first run we are getting the opportunity to work with Art Gallery Fabrics. For those of you who are not familiar, it is a relatively young fabric manufacturing company helmed by Pat and Walter Bravo that uses the most luxuriant greige goods (the base fabric after weaving before printing/dying) among quilter's cottons. Pat Bravo is one of the original in house designers for the company, but they are currently working with a number of talented designers, many of whose names are well-known in the blogging and sewing world (Jeni Baker - In Color Order; Angela Walters - Quilting is my Therapy; Bari J. Ackerman). 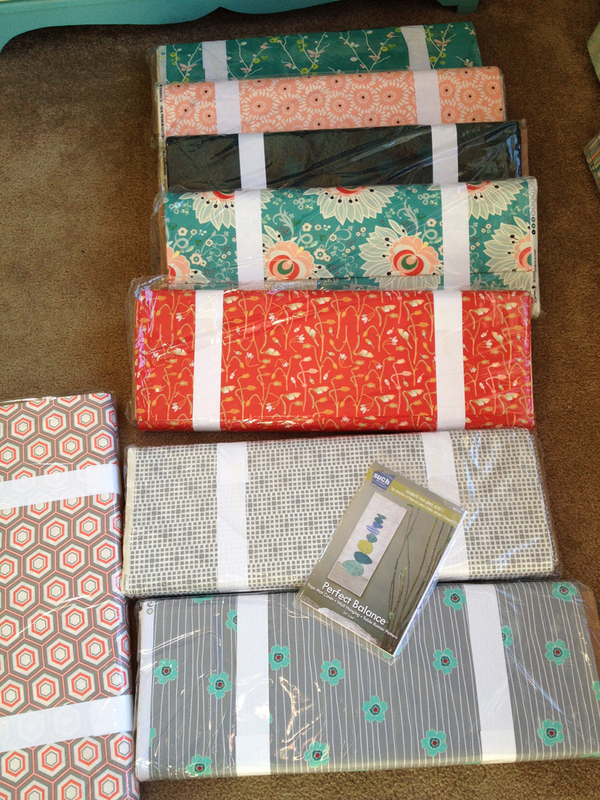 Cherie and I selected 20 fabrics to start with, most of which have arrived on our doorstep. They are being arranged and rearranged to go with the patterns we've selected to begin kitting (sneak peek above), and we are also putting together some fat quarter bundles while we await the balance of our fabric order to complete the kits. The Fat Quarter bundles are currently available in our NEW ETSY SHOP, also titled The Creative Bungalow. There will be much more to the reveal in upcoming weeks. Cherie is putting the finishing touches on our first quilt sample, I am doing some further edits on an original pattern and the creation of a logo is underway. We are excited about what is ahead and hope to see many of you on the road along the way!